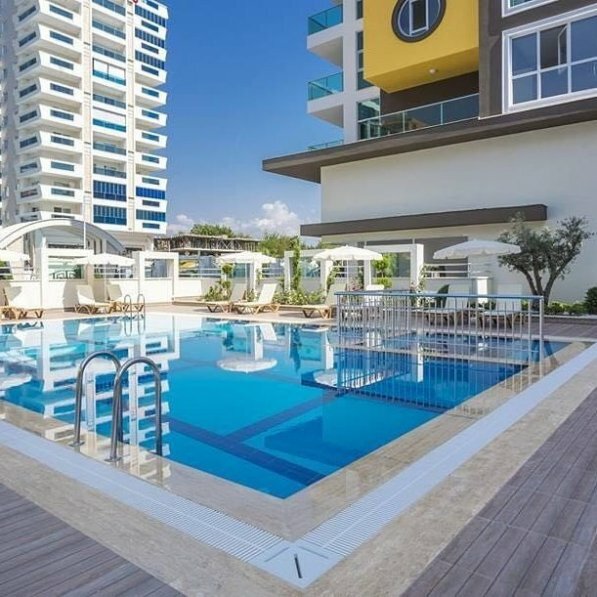 This spacious apartment is located centrally in Mahmutlar town. It is only 250 m from the sea and close to shops and restaurants. Transportation is easy enough and apartment is close to bus stops. Gazipaşa airport is just 25 minutes away by car. Local restaurants and bars are just in a walk distance. There are 2 local organic bazaars you can visit and get the fresh vegetables and fruits directly from the villagers. The sea which is 5 minutes distance by walk, is one of the beatiful beaches in Alanya that you can go easily and have time with all kinds of water sports activities such as water ski, windsurf, jet ski and others like para sailing, bananas and rings. While you are discovering the local richness of the town do not forget to have some time in the facilitiy's common swimming pool with the water slide. You may just have sun bath under the sunny sky or rest a little bit under the shadow unbrellas nearby the pool. There garden is so cutely decorated and designed with a good taste. If your children wants to play, there is also a children playground to have some cheerful time and you may just sit and rest in lobby while your children playing.